This is page 4 of the walking tour of “Little Lutzany” sequence. Here I break the 6-panel grid of the previous 2 pages with 3 horizontal panels. I probably could have continued it here, but I liked the variation of rhythm. What could have played as 6 beats (panels) become 3 long flowing beats (panels), propelled by the left-to-right audience eye read. My main regret is in panel 1, where Agent Pierce’s hand (that Burovnik yanks the drawing from) is directly below the drawing, with the unfortunate result that one sees the proffered drawing first, THEN Pierce’s hand having the drawing yanked from it. Ouch. Maybe it would’ve helped if I’d kept her arm completely within frame instead of letting the elbow drop below the lower margin. This page is an example of the influence of Ernst Lubistch. In panel 1, Burovnik cynically, casually whips the randomly assembled crowd into a frenzy as his daughter and his stooges watch with amusement. The deadpan mirth continues in panel 2; Pierce watches with angry surprise as Burovnik crumples her drawing into a ball while lecturing the elderly Archonist on the virtue of free speech then tosses it behind him in panel 3 as he sends the irate mob to their impromptu battle stations. I’m thinking of the droll satire in “To Be or Not To Be”, not just of the Nazi invaders of Poland, but of narcissist artists and sexual relationships. Playing the action out as 3 long panels makes it feel like a choreographed dance (a satiric comment on politics) rather than an accumulation of incidents (which I suppose would be a different comment). 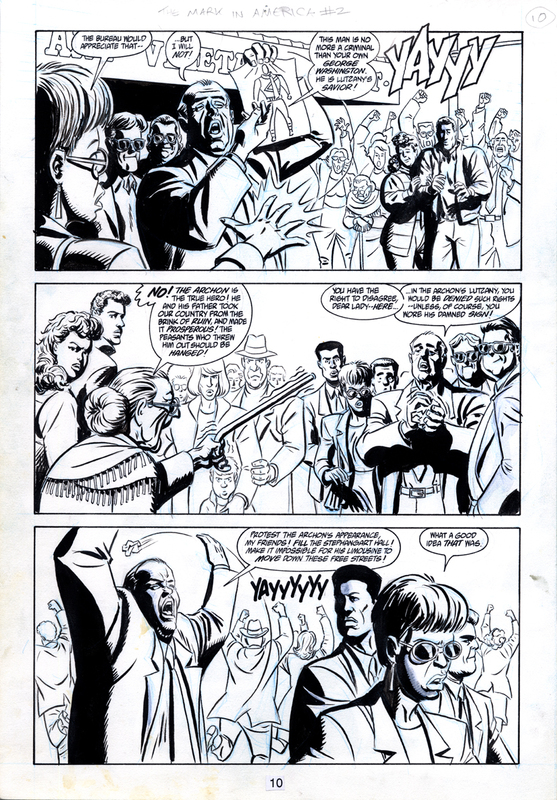 This is page10 for "The Mark" issue 2, volume 2, otherwise known as "The Mark In America", published by Dark Horse Comics in January 1994. Written by Mike Barr, drawn by Brad Rader.